The makeup of lower Woodward has gone through several changes, most recently with the addition of the Compuware headquarters building several years back. Now with Dan Gilbert on the scene, who knows what we might see next. Residential units opening this fall will be a much needed boost of pedestrian traffic downtown. Are any of our readers becoming or currently downtown residents? What’s your favorite hangout? Detroit circa 1915. 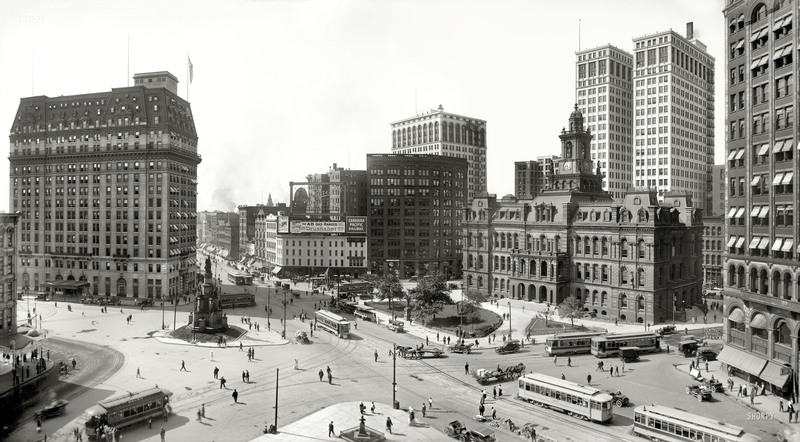 “Woodward Avenue and Campus Martius.” Among the Motown landmarks in this panorama of two 8×10 glass negatives are the Hotel Pontchartrain, Soldiers’ & Sailors’ Monument, Ford Building, Detroit City Hall and Dime Savings Bank. Detroit Publishing Company.